The Ultimate Engine Restoration Rebuild Kit Kohler K321 14HP Cast Iron Engines. STD Piston / STD Connecting Rod / Small 1 1/8 Exhaust Valve. 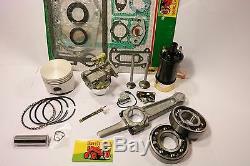 This is the ultimate engine restoration kit for Kohler K321 Cast Iron 14HP Engines with Battery Ignition System. Includes a STD Piston, STD Connecting Rod, and Small 1 1/8 Exhaust Valve. It includes everything you need to make your engine run like brand new again! There is no other rebuild kit available as comprehensive as ours. 20 Piece Gasket Set including Oil Seals. Additional style carburetor choke for old style engines. Points w/mounting bracket and Condenser. Ignition Coil with mounting bracket. Note: The exhaust valve on K321 come in 2 variations. Older style engines came with an exhaust valve that is smaller than the intake valve. The valve head measures 1 1/8 Diameter. Newer style engines came with the exhaust valve the same size as the intake valve and measures 1 3/8. We offer this kit in different Piston, Connecting Rod, and Exhaust Valve Configurations. Please visit the links to the side for "Complete Engine Kits" to find the other configurations. We have these Kits in STD. 030 oversize Pistons and STD. We can help you troubleshoot your engine, install parts, and give you maintenance advice! We Don't Just Sell Parts. We rebuild and restore engines and equipment every day. If you need any help at all with your Tractor Project, let us know and we will help you keep your tractor going for 100 years. We are Tractor Nerds and Certified EETC Technicians. So your equipment can be put back into service quickly. The item "Ultimate Engine Restoration Rebuild Kit Kohler K321 STD Piston STD Rod Small Ex" is in sale since Saturday, January 23, 2016. This item is in the category "Home & Garden\Yard, Garden & Outdoor Living\Lawn Mowers\Lawn Mower Parts & Accessories". The seller is "isavetractors" and is located in Hollis Center, Maine.